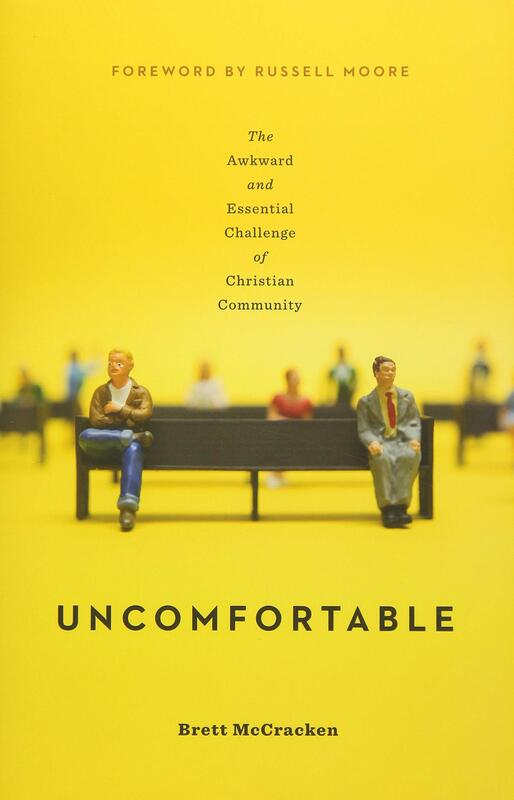 I recently finished reading Brett McCracken’s book, Uncomfortable: The Awkward and Essential Challenge of Christian Community. 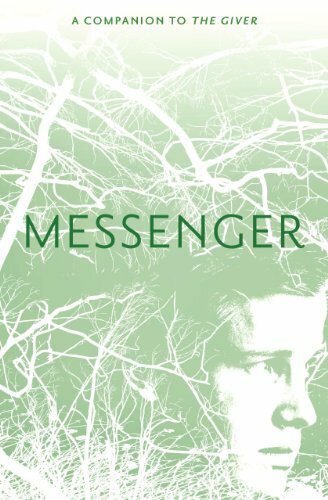 Our church made this required reading for our Life Group leaders this year, and we slowly worked our way through it, week by week, chapter by chapter, with group discussions during our Sunday evening coaching times. 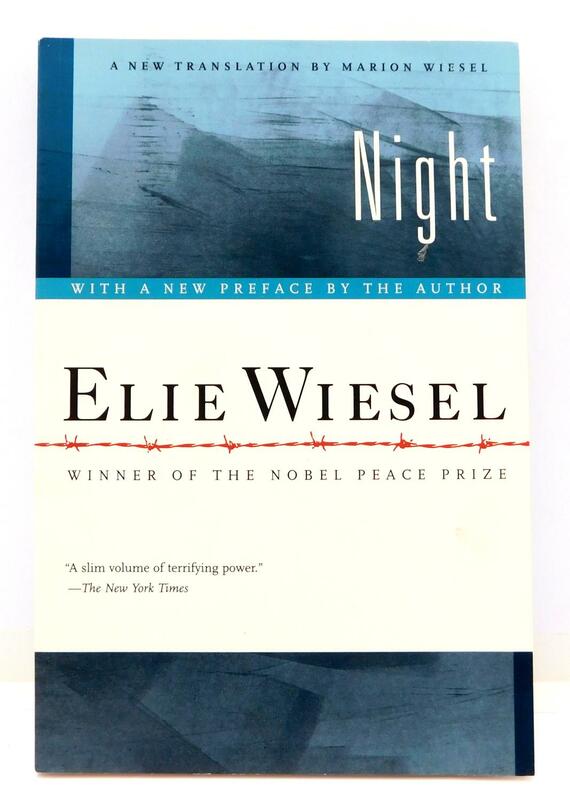 Personally, I feel that one of the surest ways to take the joy out of a book is to make it “assigned reading” — and even though I’m a part of the leadership team who was ultimately responsible for the assignment, I went into my reading of the book with a bad attitude. Still, as I dutifully worked my own way through the book, I grew to appreciate it more and more. 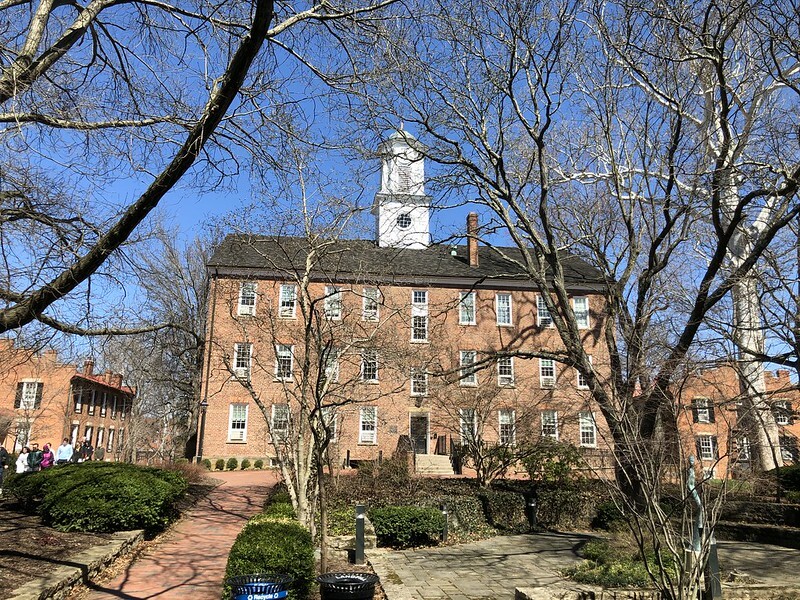 It felt like a mirror to my own processing of ministry dynamics over the last 25 years, and I found that McCracken lends an articulate voice to a valuable perspective on Christian community. The fact of the matter is that following Jesus requires us to get past ourselves. We must learn how to get past the discomforts of community in order to experience the fullness of the life of faith. 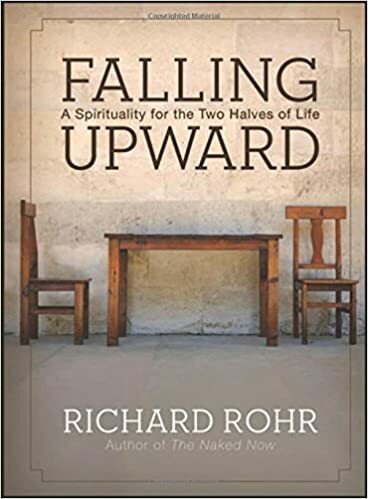 Over the last 50 years, there have been many different attempts to mitigate the awkward and uncomfortable dynamics of church life, but McCracken suggests that the uncomfortable parts of church life are often the most essential parts of our spiritual formation. Seeker-friendly Christianity tried to revive the church by infusing it with the logic of the marketplace. Hipster Christianity tried to revive the church by obsessing over newness and relevance. Both of these approaches were efforts to address Christianity’s PR problem, attempting to convince an increasingly secular population that Christianity isn’t weird, stodgy, traditionalistic, legalistic, homophobic, judgmental, anti-intellectual, regressive, and conservative as they thought it was. An admirable goal, to be sure… Yet seeker-friendly and hipster Christianity failed to invigorate contemporary Christianity because they’ve been too embarrassed to lead with the admittedly uncomfortable truth that a Christianity with no teeth, no offensiveness, no cost, and no discomfort is not really Christianity at all. 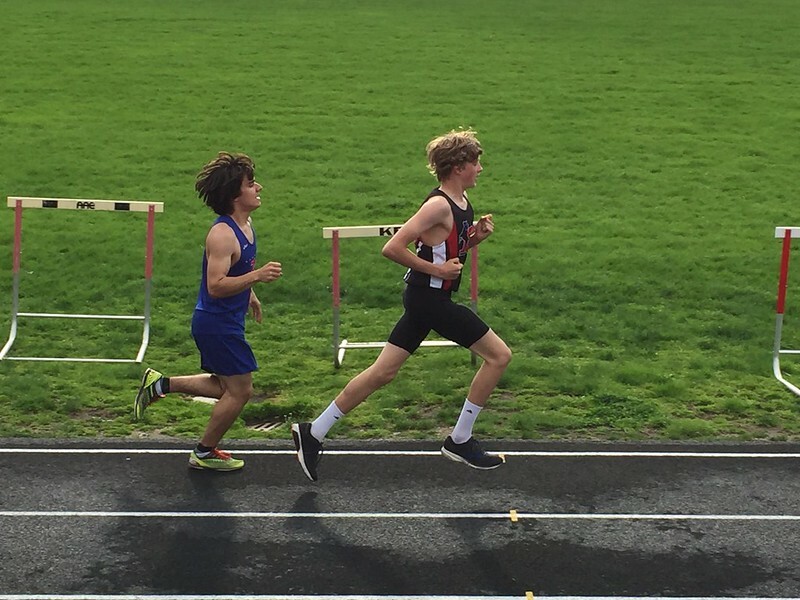 Personally, I found that the second half of the book (“Uncomfortable Church”) was better than the first half of the book (“Uncomfortable Faith”), but several of the student-leaders in my coaching group felt differently. The chapter on “Uncomfortable Diversity” was probably the most challenging and impactful for me, but there were a lot of things that spoke to me from a lot of different parts of the book. At the very least, I can say that the book prompted some valuable discussion — and I’m glad that I got the chance to learn from it. 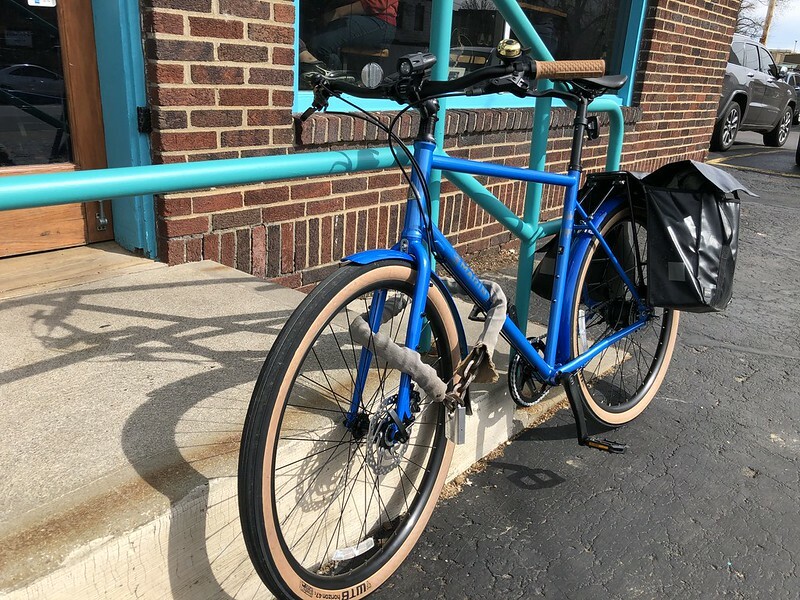 I spent a bunch of money on a new bicycle this week. I’m simultaneously kind of excited and kind of self-conscious about it. Have you seen @preachersnsneakers on Instagram? I think it’s a brilliant attempt to promote dialogue on a key issue in our consumer culture. But it also heightens my awareness of the fact that any potential purchase could be similarly scrutinized. Even a purchase I think of as perfectly justifiable. I recognize that my values lend me towards different priorities than the average American. In addition, I pay many of the basic car ownership costs regardless of how much I use my bicycle. So, it’s not fair to say that I just have to ride my bike around for two months to pay off the investment in my new ride. Still, I’ve been playing around with the numbers a bit to try and more accurately reflect the economic impact on my household. And I’ve found it interesting to see the results. I track my mileage, and I can confidently say that I bike about 730 miles per year (roughly the distance from Kent to Memphis!). Pretty much all of these miles are city miles. So let’s use my 2010 Toyota Corolla for comparison (which averages 26.0 miles per gallon in the city). Those 730 miles on the bicycle save our household 28 gallons of gas per year. And with prices at about $2.50 per gallon right now, that amounts to about $70 per year on fuel costs. In addition, I think it’s realistic to estimate about $20 per year in parking costs that I save in downtown Kent, from riding my bicycle. I expect our family would still get an annual Kent State University parking pass because of Marci’s job as an instructor. At the same time, we’ve never needed to have two parking passes to park two different vehicles on campus, simultaneously. 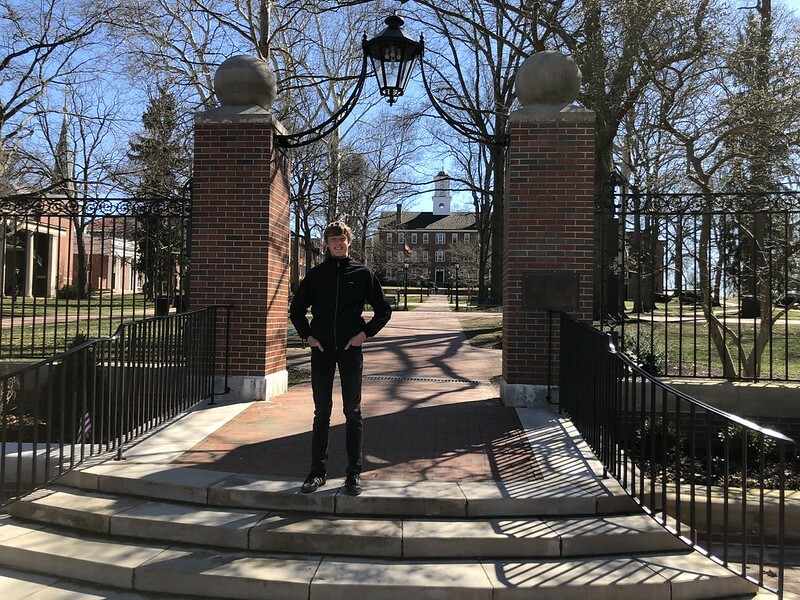 I feel confident that I would be able to supplement any of my on-campus parking needs with paid lots and metered spots at maybe one tenth of the cost of buying my own parking pass — so I’m going to say my bicycling saves our family a total of $125 per year on parking costs. I’m confident that my bicycling also helps to reduce the amount of depreciation and maintenance on our cars, though it’s harder to calculate the levels for this. I suppose it’s safest to just factor in the depreciation costs relative to mileage costs, using my 730 miles per year as the benchmark. So on the conservative end, I estimate that I save us $50 per year on depreciation. Calculating the insurance savings is even more tricky. The fact of the matter is that we do have three cars for three drivers in our household, and I have to pay insurance on all three vehicles. I honestly don’t know how much of the insurance I pay is calculated based on mileage, but I do know that total vehicle mileage is at least a factor in setting the level for our auto insurance. So even if I go really conservative and estimate the impact of my bicycle mileage to be between two and three percent of the total auto insurance costs, that still amounts to a savings of $20 per year on insurance. I believe there may also be a case for building in some savings on health care. But this is also hard to calculate — since I would be carrying insurance with or without the bicycling. I’ve talked to enough of my middle-aged friends to realize that there are significant out-of-pocket expenses to go see the chiropractor, to pay the client portion of prescription drugs, to spend on a special kind of food for a special kind of diet… which I simply haven’t had to start paying yet. I know, I know. 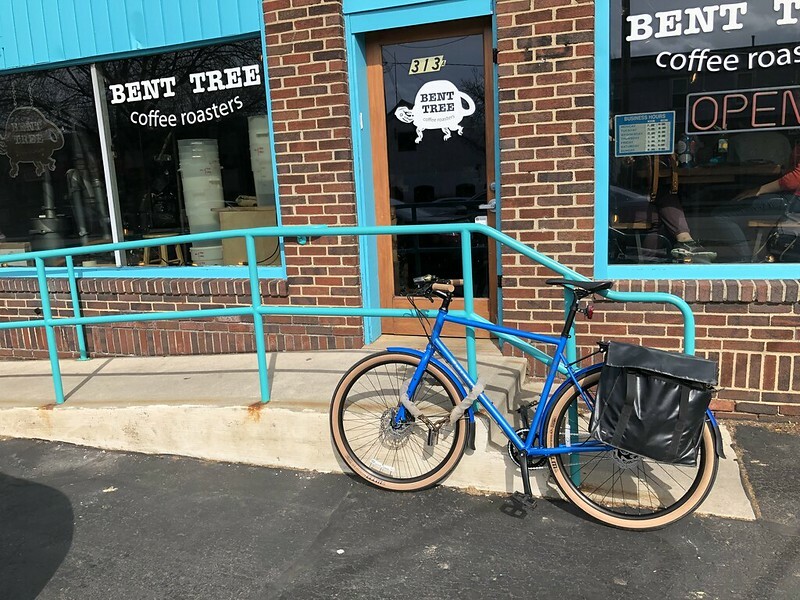 There are so many factors that go into the economics of health and aging, but I think it’s safe to say that there have been at least some health savings on account of my bicycling habit. Can we just go relatively conservative, say it’s $25 a year in health savings, and not overthink things too much? Finally, I think it’s safe to say that bicycling is also one of my hobbies. I say I do it for health, for wealth, for the earth, and for mirth. I know that last word is the most confusing for others. It just fits my rhyme scheme. And effectively communicates the laughter, levity, joy, fun, and social connection that bicycling brings to my life. Some people play golf. Others enjoy live-action role-playing games that require certain cards or figurines. A lot of guys my age like to spend time, energy, and money on their lawn care. 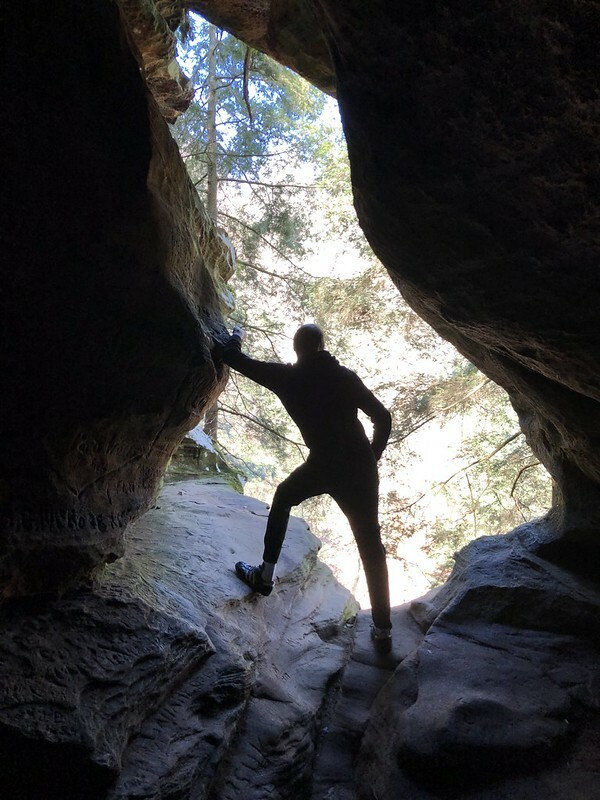 I don’t do those things; I ride a bicycle (and run, and hike, and read, and blog). Still, I think it’s reasonable to say bicycling saves me a good $25 per year on hobbies (if not more). I might otherwise be inclined to spend on other hobbies, if I didn’t have bicycling in my life. If these numbers are to be believed, my true annual savings are $315 per year. That means it will take me a bit less than four years to pay off this new bicycle. I fully expect to be riding the bicycle for that long, so I believe it’s justifiable. But if you want to talk with me about it, leave a comment below or reach out some other way. 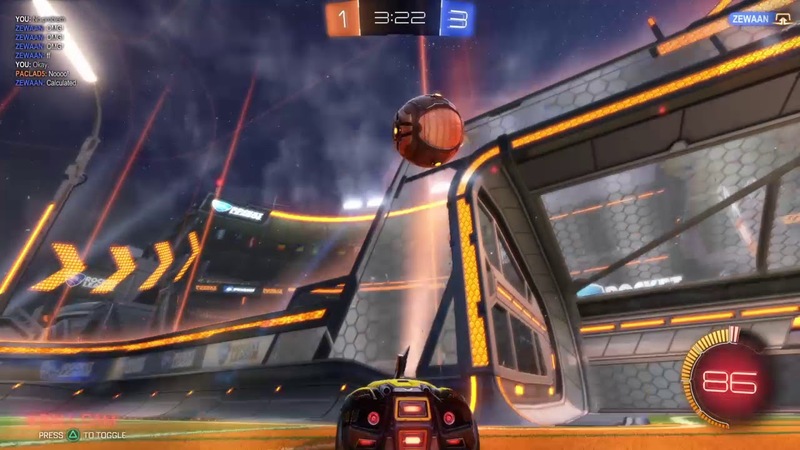 Elliot has been on a Rocket League kick lately. After school, track practice, and homework, he flops down on his bean bag chair in the attic and fires up his gaming system. He and his friend Danny team up to play random strangers from the PlayStation Plus cybersphere. The game includes elements of soccer, muscle cars, demolition derby, and science fiction. Elliot and Danny do it if they’re just thirty seconds into the game, scoring the first goal of the match. But they also do it if they score a meaningless goal in garbage time of a hopelessly-lost match to a stronger opponent. They think it’s funny. It’s their own inside joke, and it’s a sort of social experiment to see how others respond. 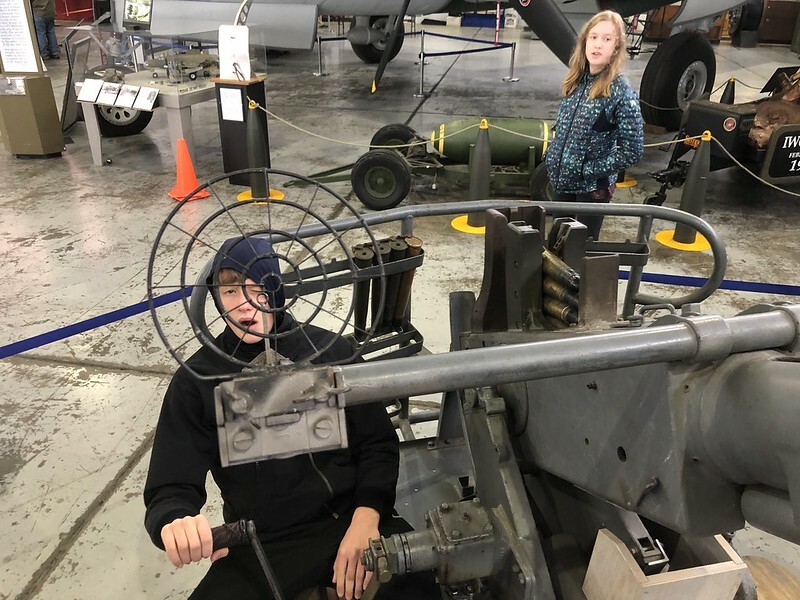 I think their “ff” joke is an interesting metaphor for the home stretch of the school year, between Kent State University’s Spring Break and Final Exams. This is a time of the year when it can be tempting to just fizzle and fade. 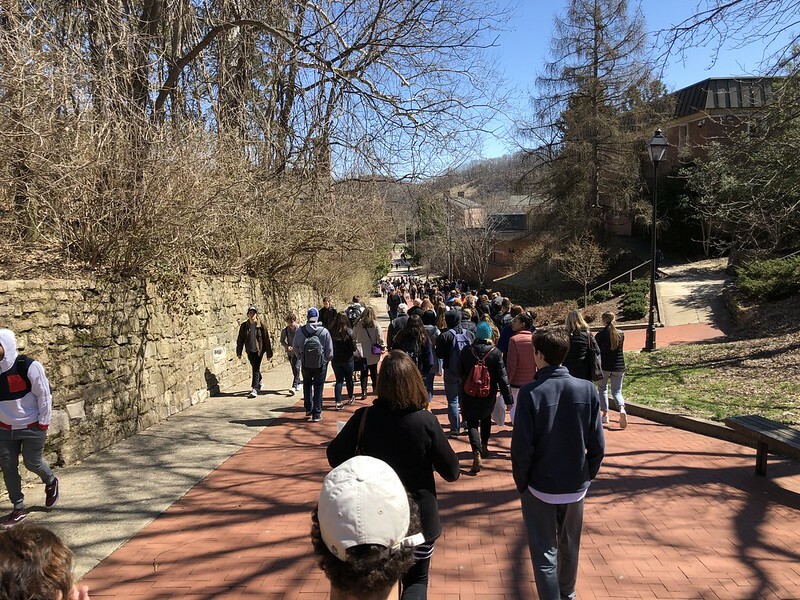 Experience suggests that it will be difficult to keep our staff and student-leaders motivated and engaged through the last month of the semester. As a result, appointments get cancelled. Balls get dropped. 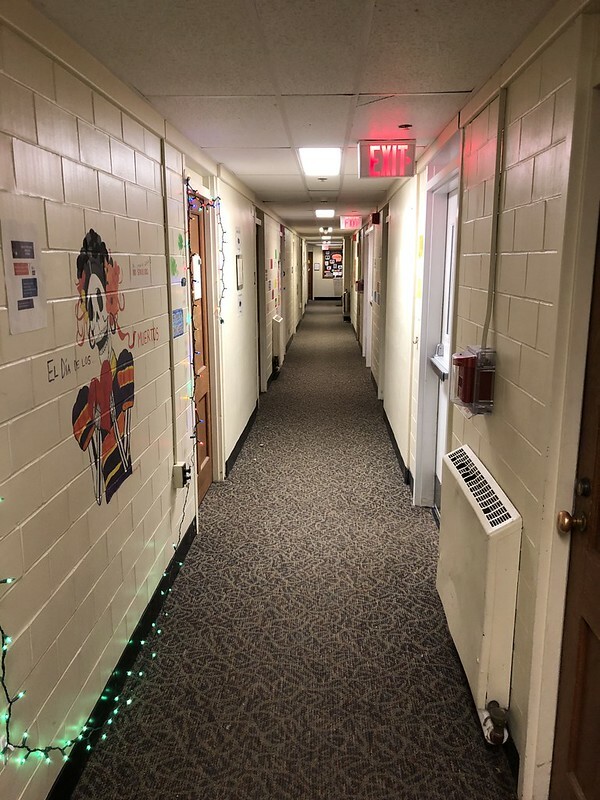 It’s just a weird time of the year in campus ministry. But I’ve recently felt compelled to seek God more earnestly this month. I feel like there is an opportunity to lean in and trust Him for good things down the stretch. When circumstances seem to prompt the question “ff,” I want to see the challenge in a different light and respond with faith and perseverance. What if “ff” prompted us to respond with a defiant resolve to “Fight the Fizzle” instead of “forfeit” and fold in the face of adversity and apathy?!? I want to live this way for my own benefit and as an example to others. This is as much a season of opportunity — to build relationships, to refine my character, to share the Gospel, and to seek God — as any other time of the year. So, I want to Pray with Passion, Go out with the Gospel, and Contend for the Campus. I want to Fight the Fizzle. And I encourage you to join me. Just try to watch this video without smiling. You don’t have to speak Norwegian to follow the story. There’s an element of joy that’s simply contagious from the tone of the man’s voice and expressions on the man’s face. If you want to understand more of the context, check out this article. The context doesn’t diminish the fun. But I like the idea of just being the sort of person who becomes deliriously joyful upon seeing his favorite junk food. The joy of the Lord should be our strength. People should see the hope we have and be compelled to ask us about it. It may not be appropriate for such enthusiasm to exhibit itself in a crowded public space — but I want to live with that kind of joy as much as possible. We tried to appeal to the Cleveland Cavaliers, as best we could. 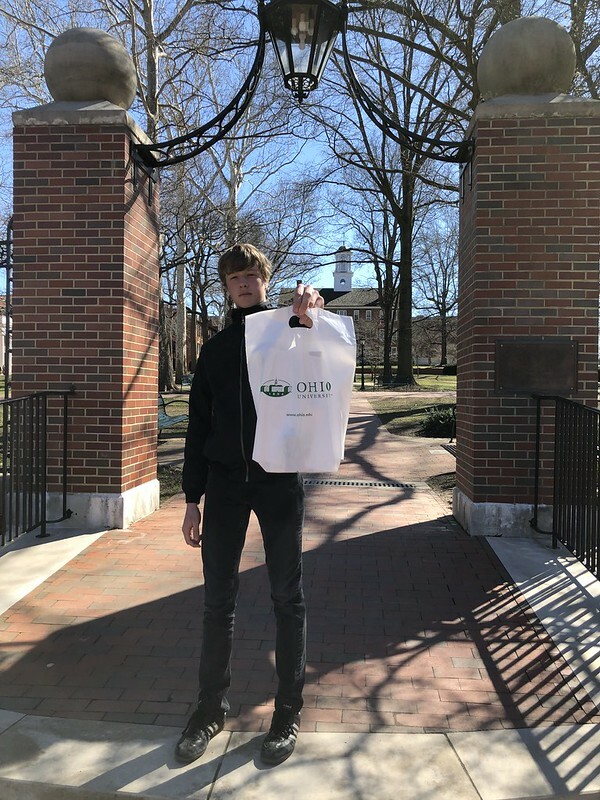 We thought we had a convincing case for Elliot playing at least some role in a brilliant promotional campaign — but we didn’t want to take an aggressive or adversarial tone towards our favorite basketball team. So we took a patient and measured approach. We e-mailed multiple contacts within the Cavaliers organization on multiple occasions, starting a year ago. We tweeted at the team, the players, and the businesses involved in the promotion, starting six weeks ago: #BobbleheadIdea. We got some friends with more significant social media presence to retweet our message. We reached out to a couple of local news outlets to gauge their interest in the story. In the end, however, it got us nowhere: no bobbleheads, no tickets, not even a recognition of our existence. I kind of understand the Cavaliers’ perspective. By ignoring our appeals, they’ve maintained plausible deniability that Elliot’s suggestions ever had anything to do with the promotion. Neither Elliot nor I have the level of notoriety or cachet (on the internet, or in real life) that makes things this story all that consequential. So it’s cleanest and easiest for them to batten down the proverbial hatches and wait for the storm to blow over. So what did we do? 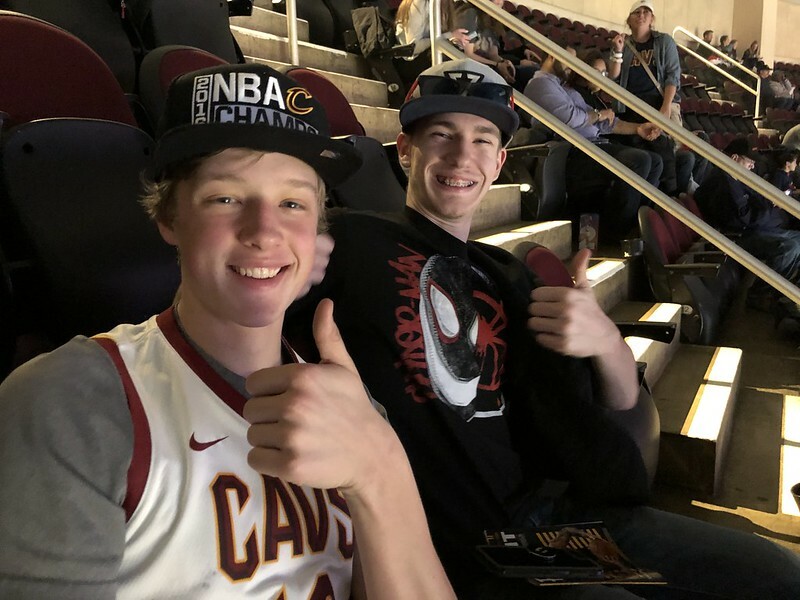 We bought four tickets — at fair market value — to last night’s Cavaliers game. We brought a friend along to celebrate Elliot’s birthday (this has been his preferred “party” for the last several years). 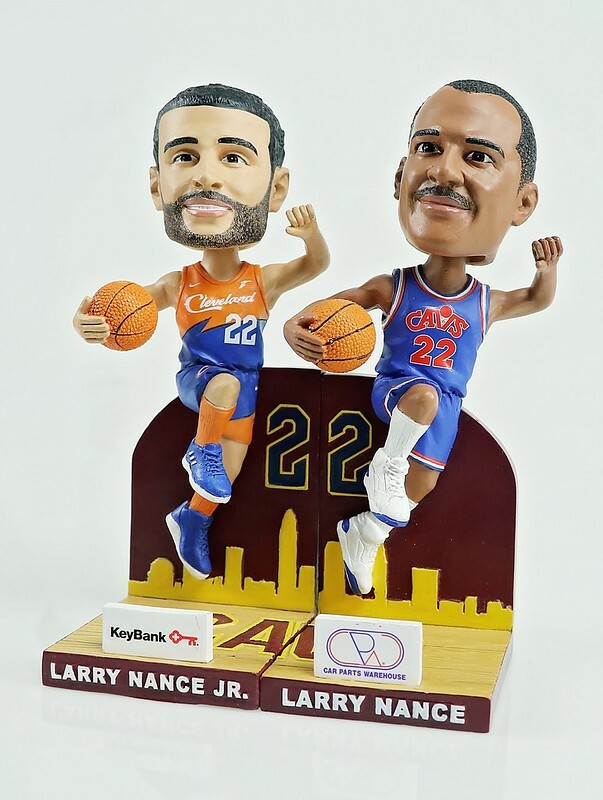 And by being one of the first 5,000 in attendance, we got the Larry Nance Sr. Bobblehead — thus acquiring at least half of the set that Elliot had originally imagined. We always have fun at Cavs’ games. We had a nice dinner in downtown Cleveland. We got some autographs from the players during warm-ups. We yelled our guts out get a prize for Elliot in the T-Shirt Toss. 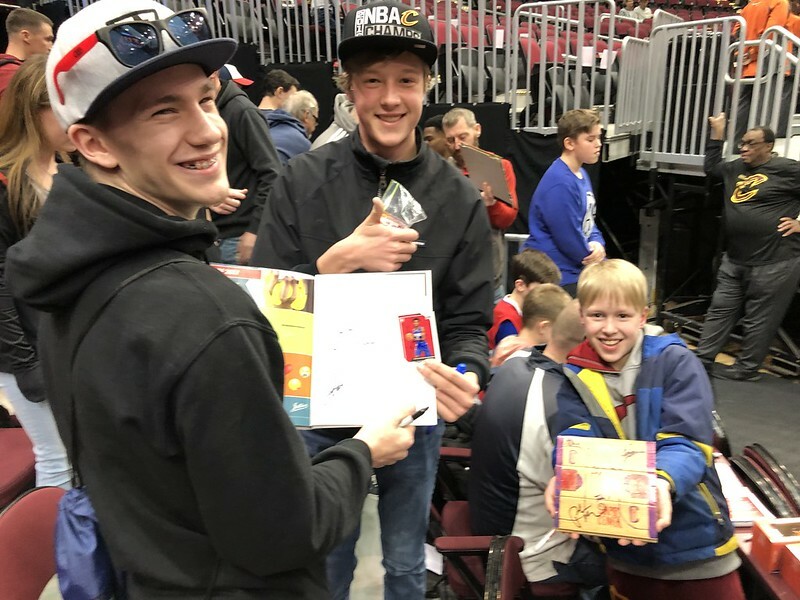 And during a break in the action, we decided to make a visit to Guest Services to see if there was anything we could do to get the Birthday Boy a Larry Nance Jr. Bobblehead to complete the set. Fortunately, we found a sympathetic ear at Guest Services. 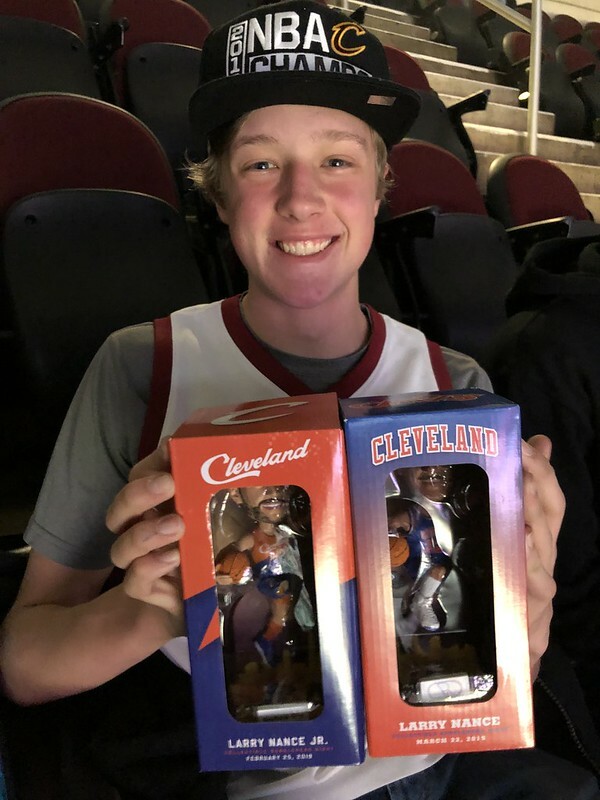 We started by saying that we had tried e-mailing and tweeting at the Cavs, without much success — but we felt like there might be some strong circumstantial evidence to suggest that Elliot might be part of the inspiration for the Larry Nance Sr. / Jr. Bobblehead promotion. Elliot got out his phone to try and plead his case on the basis of old e-mails in his “Sent” messages. But in the end, the woman at Guest Services didn’t even look at the e-mails. She just listened attentively and then kind of whispered, “I got you” before turning around to pull out a Larry Nance Jr. Bobblehead to complete Elliot’s set. In the end, I think it was a pretty easy ask on our end — and the woman at Guest Services had obviously been granted the power ahead of time to make some people happy. So the boys went crazy and hugged the woman over the counter — and we got a happy ending to our Bobblehead story.